Makai’s state-of-the-art dynamic cable model provides unparalleled accurate cable installations. Software to plan cable installations. Software to monitor and control in real-time the installation of a cable or cable system. Software to analyze in detail the installation of a submarine cable. The heart of Makai’s cable software is a powerful 3-D cable model. 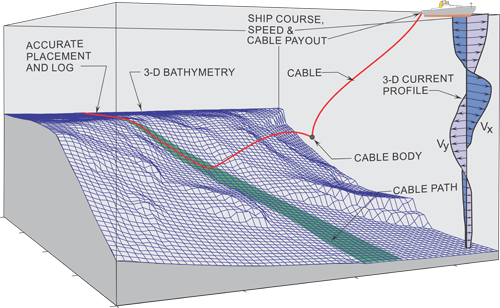 This fast, finite-segment dynamic model was developed by Makai specifically for precise real-time cable laying control. Having been used successfully prior to and during numerous critical cable lays, our algorithms have proven to be both reliable and practical. All significant factors influencing the position and control of the cable are included in these programs: full 3-D modeling, complex cables and shapes that change with time, either 3-D or 2-D bottom terrain and complete current profiles. Numerous cable types and cable bodies can be incorporated into a single cable lay or recovery. These programs are suitable for all ocean depths and cable laying speeds. Submarine cables are vital to telecommunications, offshore renewable energy and grid interconnection and seismic oil exploration. The video to the right discusses the state-of-the-art in submarine cable laying, including the problems and cutting-edge tools being used by cable installers. The telecom industry has been the primary installer of submarine cables since the 1850’s and today 99% of the world’s international telecommunication travels through these cables. Prior to the 1990’s cable laying techniques were crude and resulted in cable failures because cable installers didn’t have a good picture of what the cable was doing below the surface. In the late 1980’s Makai Ocean Engineering, Inc. developed a rigorous 3D dynamic model of the cable in the water (MakaiLay) that accurately computed the shape and touchdown conditions in real time. For the first time cable installers were able to view a real-time picture of the submarine cable properties (like position and tension) to eliminate loops, kinks, and suspensions in the cable as it is laid, and ensure an accurate and safe cable installation. MakaiLay benefits submarine cable installers, owners, and insurers. Installers use MakaiLay to accurately control the cable tension and positioning on the seabed for a safe installation, which maximizes the lifespan of the cable while minimizing overall costs (i.e., less time at sea, higher quality installation, less repair, lower risk of lawsuits). Please watch the movie to the right or contact us for a more detailed explanation of how MakaiLay works. Click here to watch additional videos on Makai software. Makai provides a comprehensive set of cable-related services that leverage the expertise of our engineers and the sophisticated tools in our software products. These servcies include assistance with planning your cable route, simulating your lay, and installing your telecom or power cable at-sea. We also provide submarine cable software training. Makai's involvement in submarine cable systems dates back to 1983 when Makai developed a finite element cable model to accurately install a deep water power cable in Hawaiian waters. The success of the project resulted in rigorous testing and development of the at-sea, real-time cable model and follow-on planning and simulating desktop tools. The accuracy of the model has been validated on numerous occasions during precision cable array at-sea installations.